A rare Czechoslovakian Tatra car, manufactured at the height of the Cold War in the Eastern bloc, is to go under the hammer in Dorset on November 4. Little history is known about the 1950 Tatra T600 Tatraplan car, although the name of the vehicle was derived from the new Communist planned economy, along with the inspiration for its design taken from the aeroplane industry. Production of the model began in 1948 in Czechoslovakia. Finished in silver with suicide doors and a brown leather interior, the car is unusual with its 2-litre flat four engine fitted in the rear. However, what is possibly more unusual, and quite striking, it the aerodynamic body complete with distinctive fin at the rear. 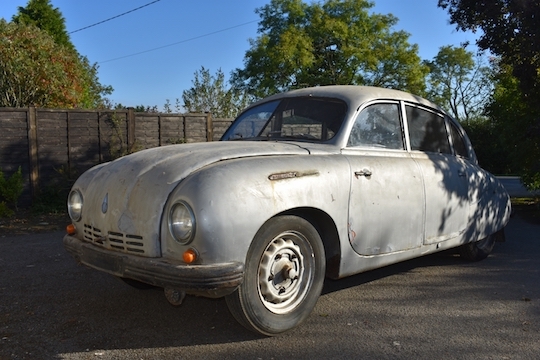 One of just a few Tatra T600s known to exist in the UK, this rare cold war car is estimated at £8,000-12,000 in the sale.